During the past year, I have been a heavy user of Drafts, a simple-looking yet very powerful note taking app. We just witnessed the release of Drafts 3.0. Instead of focusing on what the new features are, I would try to share several benefits that might convince you to use Drafts if you haven't used it prior to today. You can setup a timeout period, where if you return to Drafts beyond that period then Drafts would automatically start a blank post for you. Drafts has a relatively fast loading time. Upon loading, you will be prompted with a blank text area, a keyboard, and a cursor that's already focused on the text area - ready for your input. Hence, with a single tap on the Drafts app icon, you can immediately write down your thoughts. You can even setup a timeout period, where if you return to Drafts beyond that period then Drafts would automatically start a blank post for you. Otherwise, it will show the latest post that you're working on. 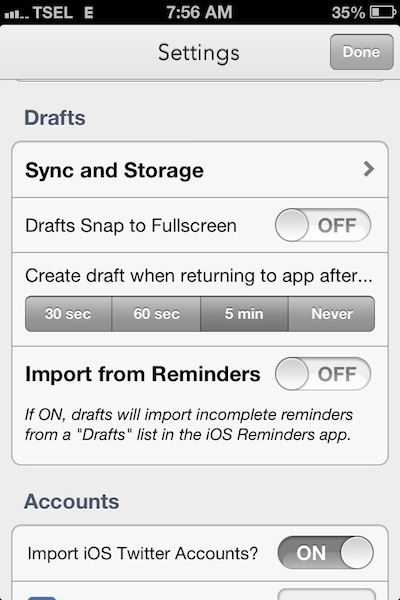 Once you're finished, you can route the notes to the appropriate app using the actions in Drafts. Drafts has been a major workflow change for me. Instead of pondering where I should write down my thoughts, I simply open Drafts and start writing. Once I finish, I can route the notes to the appropriate app for the content. If it's a draft for my blog post, I could redirect it to Byword. If I need to send it to someone else, I can choose between iMessage or Email. I can also choose to print it, share it to any social network, add it to my calendar, forward it to my journaling app, or even append it to a log file in Dropbox. Pin is a new feature in Drafts 3.0 that allows you to store your notes in a dedicated tab for easy retrieval. It is quick and easy to create a note in Drafts. Simply hit the + button to create a new one. Prior to Drafts 3.0, I have never really used Drafts as a way to store any note templates. I just write down what's on my mind and route it. I'm not worried about the storage, since I never intended it as my permanent storage. To me, Drafts is simply a scratchpad, and I already have dedicated places to store these notes more permanently. On the other hand, I know that other people are also using Drafts as a way to store notes that they need to keep for later use. If you're such a person and you don't have a good permanent storage to store your notes, Drafts 3.0 adds a new feature that allows you to pin your notes and store it in a dedicated tab for easy retrieval. In addition to the pinned tab, Drafts 3.0 has the inbox tab, archive tab, and all tab. All new notes that you create will automatically go to the inbox. With a single swipe, you can reorganize each note from one tab to another. Drafts also has a really fast full-text search capability. Tap on the search icon and start typing. Drafts will automatically show all the notes in the active tab that matches the text you're entering. Simply switch the current active tab to apply the search filter to another tab. 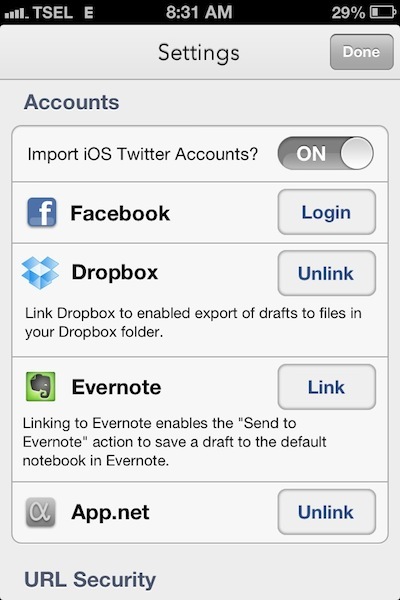 You can link multiple Twitter accounts that you have, alongside App.net account, Dropbox account, Evernote account and Facebook account. Everyone has their own favorite Twitter clients and App.net clients. But, there are times when you want to post something to your social networks without being distracted with the timeline. This is especially true if you start writing in Drafts without knowing that you would be sharing it with the world. Drafts is a Twitter client. But, it's also an App.net client and a Facebook client. Hence, anything that you write can immediately be posted to your linked Twitter account, App.net account and Facebook account. It's a good way to crosspost your thoughts without having to switch apps, too. Since there is no limit to the number of actions that you can invoke on a post, you can basically tweet it, then post it to App.net, and follow up with a share on Facebook. Everything within one single app. Be mindful that Drafts doesn't support URL shortening. Hence if you're sharing a URL on Twitter, please be mindful of its 140 character limit. Drafts 3.0 allows you to organize actions into four action tabs. Drafts has a lot of settings buried in the Settings panel. You can tweak the font face, font size and color scheme. You can even modify the actions listed in Drafts. Drafts comes with plenty of "Send to" actions. You probably don't have all the apps that Drafts supports. Fortunately, you can choose to hide the ones that you don't use. You can rearrange the actions such that the most frequently used ones are listed prior to the least frequently used ones. The new Drafts 3.0 update even allows you to organize your actions into four action tabs. Drafts 3.0 adds a new Message Action that allows you to send canned messages to one or more of your contacts. Drafts allows you to create your own custom actions, including Email Actions and Dropbox Actions. Using the Email Action, you can define an email template with predefined recipients. The actions can be setup to easily convert the first line of your draft into the email subject and the rest of your draft as the body. You can use this feature to create canned emails or trigger IFTTT actions. Using the Dropbox Action, you can either create a new text file in Dropbox or prepend/append your draft into an existing text file. I personally use the Dropbox Actions as a way to append new information to log files. 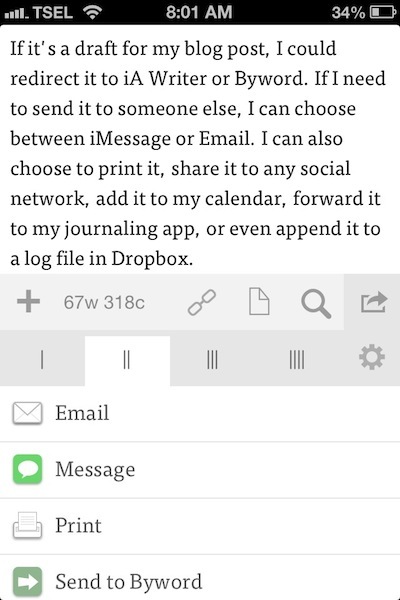 The new Drafts 3.0 update brings two new custom actions: Message Actions and Evernote Actions. This allows you to send canned messages to one or more of your contacts, and send your notes to Evernote - complete with tags and Notebook destination. 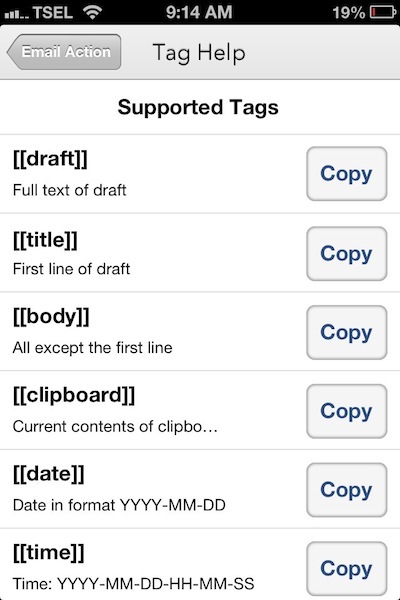 Drafts 3.0 adds a new [[clipboard]] tag to the list of supported tags. The templates that you use to send emails, messages and notes using the custom actions above are fully customizable. You can send the entire content of your notes as is, using the [[draft]] tag, or you can use other supported tags to customize how your posted content would look like. For example, if you're creating an email template, you might want to use the [[title]] tag as the email subject, and the [[body]] tag as the email body. Another example, if you're logging a bit of information to a file in your Dropbox folder, you might want to use the [[date]], [[time]] and [[date|format]] tags instead. Drafts have an excellent Markdown support and several useful Markdown actions too. Drafts has an excellent Markdown support. You can write in Markdown format and preview it using the built-in action. You can also copy the generated HTML into the clipboard for further processing in other apps. You can also print the HTML, send it via email, and create an HTML-format note in Evernote. You can create or import any number of URL actions to extend and personalize your Drafts experience. If you have plenty of other apps, there's a big chance that your apps are supported by Drafts through URL Actions. iOS apps are allowed to publish their own URL schemes that allow them to receive requests from other apps. If you have apps that support URL schemes, you can send your draft or trigger their actions from within Drafts. For example, I can send my current draft into Fantastical as new events. I can also send a request to Tweetbot or Riposte to tweet my draft or post it to App.net. I can use the draft content as a search query to Google, Bing or DuckDuckGo, using either Safari or Chrome. The list of things that I can do with URL Actions are almost endless. You can find new URL Actions to install from Drafts Action Directory. The actions listed in this directory are regularly updated with new ones, including submissions from other Drafts users. To create your own custom URL actions, you may need to learn more about the URL schemes supported by Drafts in their technical documentation. This diagram shows what happens behind the scene when a chain of actions is triggered. In addition to the URL schemes that many developers have chosen to support in their apps, a handful of developers have also supported the x-callback-url specification. This specification allows you to extend your URL schemes such that you can define a success route of where you want to go after the app finishes your request. Log Search Keywords. It's a Dropbox Action that allows you to prepend the new search keyword in "Search Keywords.md" file in Apps/Drafts folder. Search in Chrome. It's a URL Action that allows you to search in Chrome based on the your draft, and return to Drafts when the user taps on the Back button. Logged Google Search. It's a URL Action that allows you chain both actions in a single tap: Log Search Keywords in Dropbox, then Search in Chrome. If you want to learn more about all the great stuffs that you can do with x-callback-url in Drafts, you might want to check out tutorials and workflows that I have written to help both new and advanced users to explore this powerful feature. 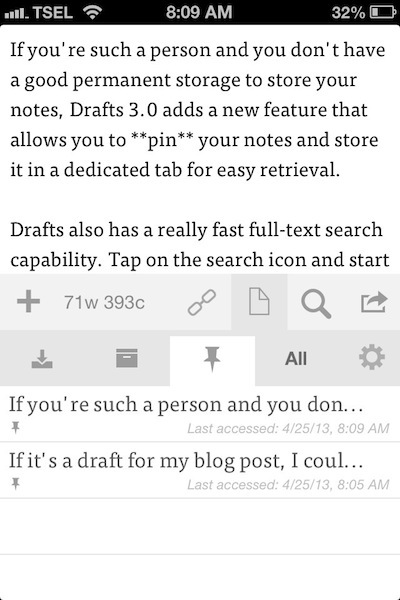 Drafts is an app designed to quickly capture your thoughts. Then, you can trigger any action to redirect it based on your intents. It's easy to personalize and extend according to your needs. And if you're an expert user who's looking to automate your workflow, Drafts is a must-have enabler for all the cool things that you can do. It has personally changed the way I interact with the information and apps on my iPhone, and also other services on the internet. It has become a mainstay on my dock for a few months, and I believe it could be on yours too.